The ceremony is non denominational. Included will be candle ceremonies and meditations culminating in a symbolic burning of the yule log. Anciently the ritual was to keep the log buring for 12 nights over Christmas and some people still burn huge candles keeping them alight for the twelve days fo Christmas (though fire safety wise a bit risky). Once our little log display is festooned with candles at the celebration we normally keep the display and light the candles at each Yoga class over the Christmas period, room permitting. Sprinkle in a little singing, a little chanting and a little dancing and you have the idea. All completely voluntary of course. 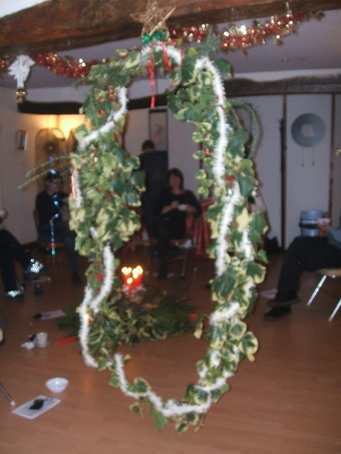 The wreath, made from gathered greenery following romps in the (usually muddy) woodlands is hung from the beams allowing people to walk through with their desires for the new year firmly focused and the ritual allows them to leave behind the shackles of the old year for a new beginning. The wreath represents the circle of life. Trees and wreaths are often significant especially together in traditional rituals with candles placed to represent the 4 directions. Circles are fundamental to many aspects of modern life - family circle, circles of life, yin yang etc etc. Each person is asked to bring a small amount of dried herbs, berries and other small pieces of natural vegetatio (preferably pleasant smelling) to add and stir in to a potpourri on arrival to share their good fortune with the group. Cost is £20 and you can now book on line.